Monitor Audio Vector AV10 review | What Hi-Fi? 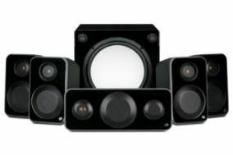 Monitor Audio's Radius range of style speakers is expansive and impressive. However, the R90HD10 package costs £1270, so there's demand for a stylish, sub-£1000 package. Enter the Vector. The Vector range consists of a V10 satellite, V20 centre, and VW8 sub; a 5.1 package can be had for £650. This, though, is an upgraded system – the VW8 replaced by the Radius R370HD. It's fair to say the Vector units don't quite have the sleekness or style of their Radius counterparts – or in fact their rivals. The units are bigger, and a slightly more traditional shape than most. However, they are more compact and stylish than average bookshelf speakers, and the bundled, single-point wall brackets make them living-room friendly. Out of the box, the treble can be rather piercing. This calms down hugely after a few days of running-in and will continue to improve over the first couple of weeks of use. Still, we'd recommend you avoid partnering them with bright electronics. Once well run-in, what most impresses about the Vector AV10 package is the size of its soundstage, which seems to extend beyond the position of the speakers and confines of the room without making the whole delivery sound distant. This makes action scenes like the final battle on the Transformers Blu-ray sound as epic as they should, and the whole experience is enhanced by a cohesive surround field that extends behind the listening position better than most rivals. That Radius subwoofer integrates well with the Vector satellites, too. It produces lower, chunkier bass than most, but because the satellites also go lower than most competitors in this category, the crossover remains convincing. The overall sound isn't as agile as some rivals, nor is its soundfield quite as seamless as others we've seen, but the integration and tonal solidity make this a capable system. Compared with its strongest peers, the Monitor Audio system doesn't find the last iota of detail and nuance, but it's far from mob-handed. Still, if your priority is getting the biggest sound possible from small speakers, the Vector AV10 is well worth a listen.